Pamilacan Island is a coral island, and fossilized seashells are preserved on the island's rocky hill. Jaws and other bones of marine mammals and whale sharks adorn some homes in the village. The blue waters surrounding the island teem with lush and colorful marine life. The marine realm of Pamilacan Island provides whales and dolphins with the ideal refuge. Although there is no guarantee that one could experience the thrill of seeing whales and dolphins during the trip, looking for these mammals has become easier. Another site, Cervera Shoal (Snake Island), is quite often combined with an outing to Pamilacan. It is a sunken island with a sea mount rising to 15m. There is a colony of banded sea snakes here, leading to its other name, "Snake Island". Corals are not so good, but large pelagics more than make up for this. Regular visitors include whitetip sharks, butterflyfish, scorpionfish and sturgeons. Pamilican is an excellent place for drift dives – on occasions manta rays and even whale sharks have been spotted here. Beware of the strong currents, experience in drift diving might be required! Pamilacan Island is also the place to go for visitors who want to see dolphins and whales frolicking in their natural habitat. The seas around Bohol are a haven to more than 11 species of dolphins and whales, including the bottle-nose dolphin, Risso's dolphin, pan-tropical spotted dolphin, long-snouted dolphin, Fraser's dolphin, melon-headed whale, short-finned pilot whale, Bryde and the sperm whales. Seldomly seen are the pygmy-sperm whale and the Blainville's baked whale. 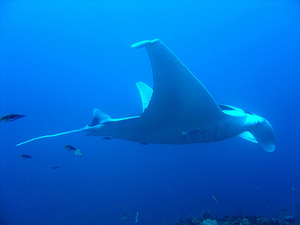 Other non-marine mammals encountered in the area are manta rays and whale sharks. The small island of Pamilacan is nestled in the heart of the Bohol Sea, the Visayas Archipelagos in the Philippines. Its name is derived from the word pilak, which is a large hooked implement made and used by the islanders to capture manta rays, whale sharks and bryde's whale. The Bohol Sea is said to be a breeding ground of these mysterious but beautiful creatures. The island in previous times, served as a watch station against the intrusion of pirates and enemies of the Spanish colony as evidenced by the 200-year-old Spanish fort on the northeast side of the island. Today, 235 families live in the island. The people used to hunt dolphins, whales, whale sharks and manta rays but these animals are now fully protected by law in the Philippines. It seems they found a more ecological occupation, because now you can go to Pamilacan to do whaleshark and dolphins watching. The attractions on the island that may catch your interest is the ancient Spanish fort, the Santa Cruz at the chapel's altar, the life within the marine sanctuary and the white beaches around the island. Pamilacan is a coral island and fossilised seashells can be seen on the island's rocky hill. At present, the jaws and bones of marine mammals and whale sharks still adorn a number of homes of the village. The blue waters surrounding the island teem with lush and colorful marinelife. Visibility: Visibility is between 10 and 40 feet (3 to 12 meters). Water Temperature: 25°C and 30°C (77° F and 86° F).